Over 800 species of fishes are reported to produce species-specific sounds. The sounds are produced for a number of different reasons, including aggression, stress or alarm, and mating displays. 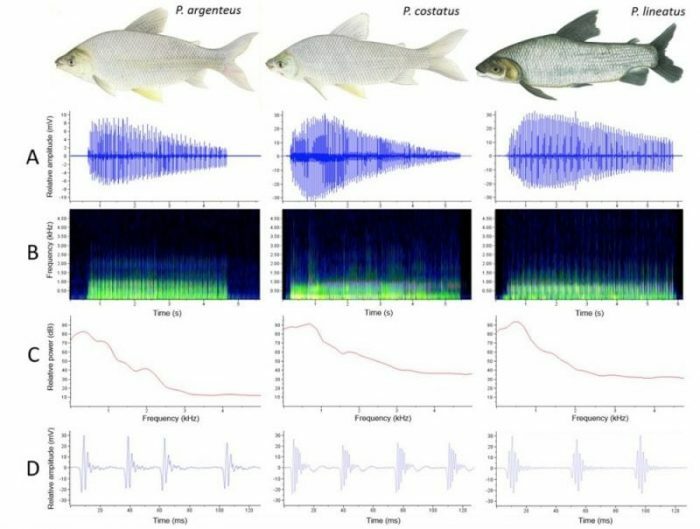 Fishes have evolved the ability to produce sounds using a variety of mechanisms – the largest diversity of sound generation mechanisms among vertebrates. These mechanisms include two major categories – stridulation, which is the rubbing together of body parts such as ligaments, spines, teeth, and cranial elements, and swim bladder vibration produced by specialized sonic muscles. In a recent study, researchers from Brazilian and United States universities collaborated to record and analyze the mating calls of three species of fishes from the family Prochilodontidae (the flannel-mouth characins): Prochilodus argenteus, P. costatus, and P. lineatus. These fishes have fleshy lips that can be extended into a sucking disk. Endemic to South America, they are sometimes found in large schools and are an important local food fish. They migrate upriver to spawn and make audible grunting noises during the spawning season that have been described as sounding like a motorcycle or snoring. In these species and other procholodontids, the intercostal muscles associated with the first four ribs are dark red in coloration in reproductive males, and it is hypothesized that sound production is due to these muscles contracting around the swim bladder of the fish and causing vibration. The three species of fishes were induced to produce mating calls but injecting them with carp pituitary gland extract (which has hormones that promote spawning behavior) and placing them in outdoor ponds. Hydrophones were placed in the ponds to record the fish sounds for 1-4 hours, and then these sounds were analyzed using bioacoustic analysis software. The sounds were trains of pulses that lasted up to 11 seconds. It was discovered that bioacoustical characteristics (i.e., train dominant frequency, pulse duration, and pulse period) could be used to discriminate between the three species. For example, the calls of P. lineatus are approximately 100 Hz higher in frequency than the other two species. This is important since fisheries biologists in Brazil would like to use passive acoustic monitoring (PAM) to help track migration and spawning patterns in these species. Now that the sounds of each species have been characterized, this is possible. While we know that these sounds are associated with courtship and spawning behavior, there is still much to be learned about the function of these calls and whether similar or different calls are made under non-reproductive behavioral contexts. 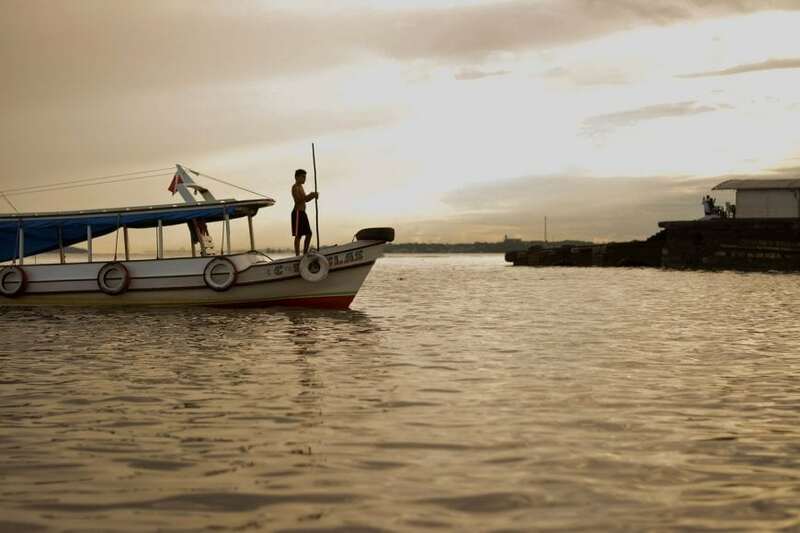 These findings are described in the article entitled Mating calls of three prochilodontid fish species from Brazil, published in the journal Environmental Biology of Fishes. This work was led by Dr. Alexandre Godinho from the Universidade Federal de Minas Gerais in Brazil and Dr. Michael Smith from Western Kentucky University in the United States. Smith, M.E., Weller, K.K., Kynard, B., Sato, Y., Godinho, A.L. 2018. Mating calls of three prochilodontid fish species from Brazil. Environmental Biology of Fishes 101:327-339. https://doi.org/10.1007/s10641-017-0701-3. My primary current research focus is the process of auditory hair cell death and regeneration in the zebrafish inner ear, with the goal of finding therapeutics for human hearing loss. Microarray analysis of zebrafish ear tissue showed that growth hormone was significantly upregulated two days following acoustic trauma. Since then, we have found that growth hormone can significantly mitigate noise-induced hair cell and hearing loss, and can promote auditory hair cell regeneration. 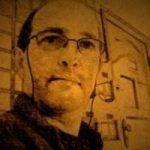 Alexandre is a research scientist and professor at The Federal University of Minas Gerais.